Should we use a physical board or an electronic tool? In the agile world, this question is at the center of many heated debates. Both solutions have their advantages and both have their flaws. Physical Kanban boards have visibility and presence. They encourage face-to-face communication, enhance stand-up experiences and serve as a constant reminder of team goals and achievements. Digital boards are accessible from anywhere, making remote collaboration a breeze. Digital boards are great for distributed teams and maintenance of charts, and they link directly to the associated tickets. JimFlow is a hybrid tool that combines advantages of both worlds: A physical board linking all tickets to its digital counterpart through QR codes. Firstly, the physical board is equipped with QR codes. The columns, which represent the status of a task are separated with a special QR code at the top of the board. Another special QR code identifies the board itself.The printed tickets also include unique QR codes so that they can be identified.Now a camera takes photos of the board at selected intervals and the photos are then transmitted via WIFI to an FTP server.On the server, the photos are analyzed, the QR codes are recognized, the tickets are ordered into columns and finally an output file will be generated. With this file, a digital version of the board will be created and the issue tracker will also be updated. JimFlowPrint enables you to print your tickets from your issue tracker (currently JIRA and Trac) with just one click. It is written in PHP with the Symfony2 Framework and uses Google Cloud Print to deliver the print job to the selected printer. The printed ticket will include a small QR code to identify the ticket. JimFlowCam is a small LUA script running on Canon Cameras and enables fully automated interval shooting including auto-delete of older images due to privacy and space issues. A special SD card will transmit the photo via WIFI to a specific ftp server. JimFlowKlopfer handles the magic. A little application, written in python, scans the photos for QR Codes, sorts them and creates an output file (JSON). 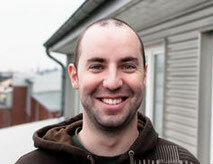 JimFlowWall, written in PHP with the Symfony2 Framework, manages the boards and snapshots and displays them in a digitized format. JimFlowWall also updates the issue tracker on card movement. 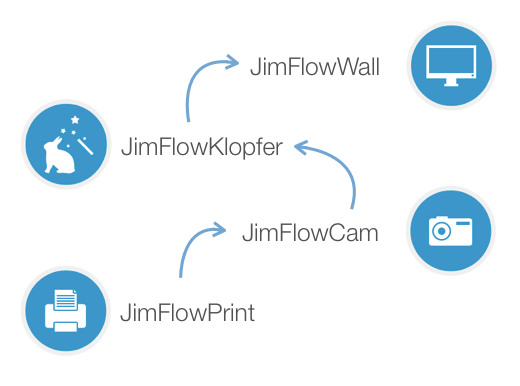 JimFlow is free and Open Source. Happy installing! In chilly November 2011, Michi headed north to join the team in Hamburg. He enjoyed his co-op semester at Jimdo so much, it was an easy decision what to do after graduation: work as a web developer at Jimdo! When he's not in front of the screen, you're likely to find Michi outside on his mountain bike. Though he does miss the mountains, he's not immune to the allure of the sea, either.